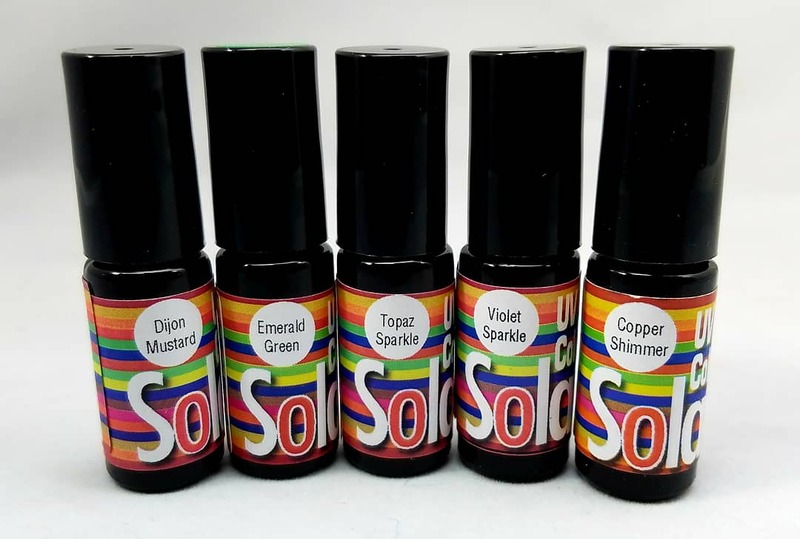 An all new 17 color selection of resins from Solarez. This Thicker resin comes in several fluorescent colors, along with several earth tone and sparkle mixed colors. perfect for coating a thread head, shell back, or body base. Approximately the same viscosity as 30 wt. motor oil. It is easy to apply a thin, shellac-like, clear coat that will cure in seconds when irradiated with sunlight or our UV flashlight. This product is a very durable aliphatic urethane which characteristically does not yellow with age. The perfect Formula right in between Thick and Thin. 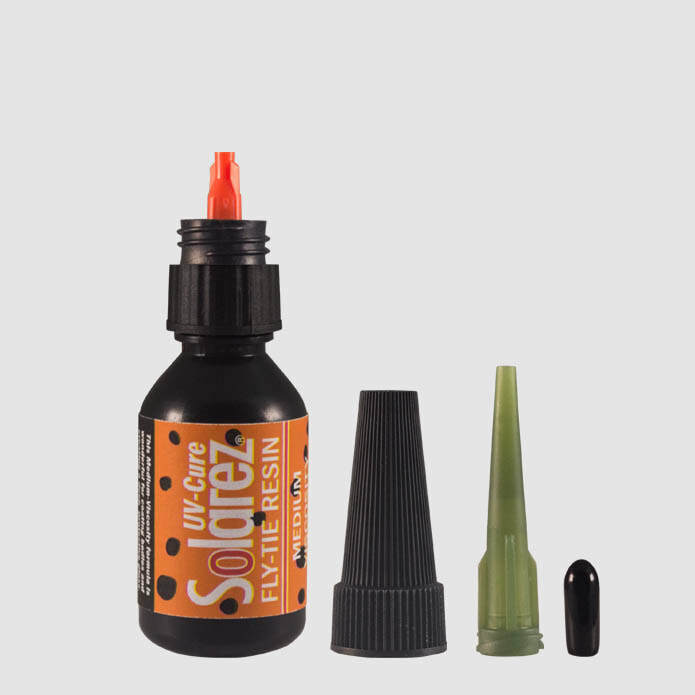 Perfect for all the same applications at the right viscosity you have been waiting for. 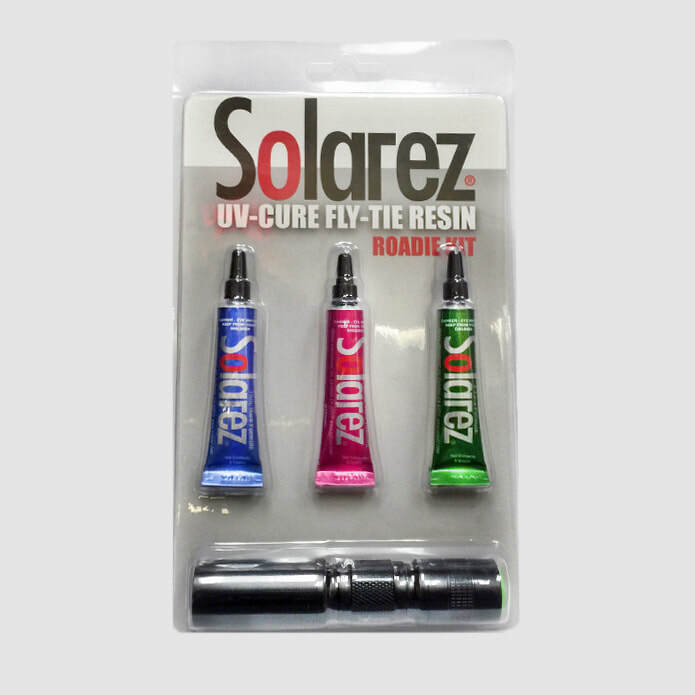 Curing in seconds with a UV light and great for building heads, bodies, and any other fly tying application you can think of. 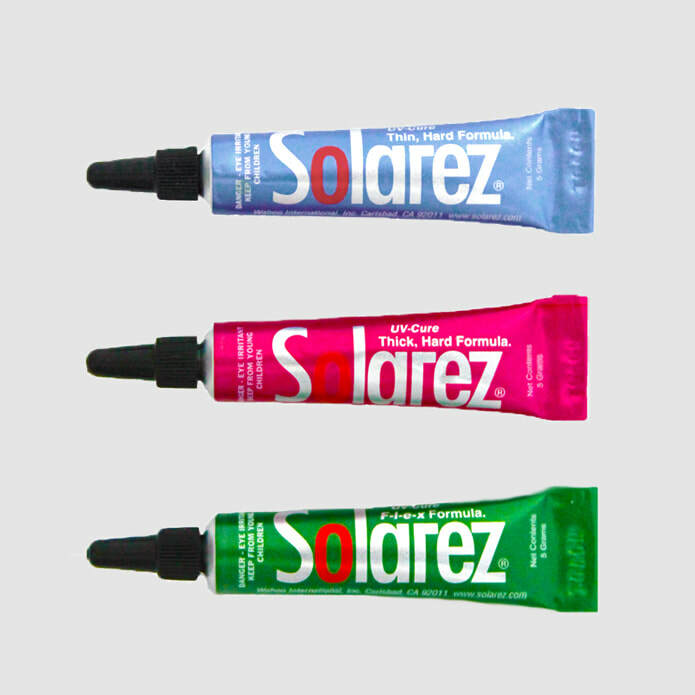 ​ No more mixing 2-part epoxies! No more wasting precious fishing time waiting for messy epoxies to set-up when you are tying your flies. Get back on the fish! Work with it as long as you need to as it will only cure when exposed to UV light. It is also great for repairing damaged flies or repairing home projects in a flash! 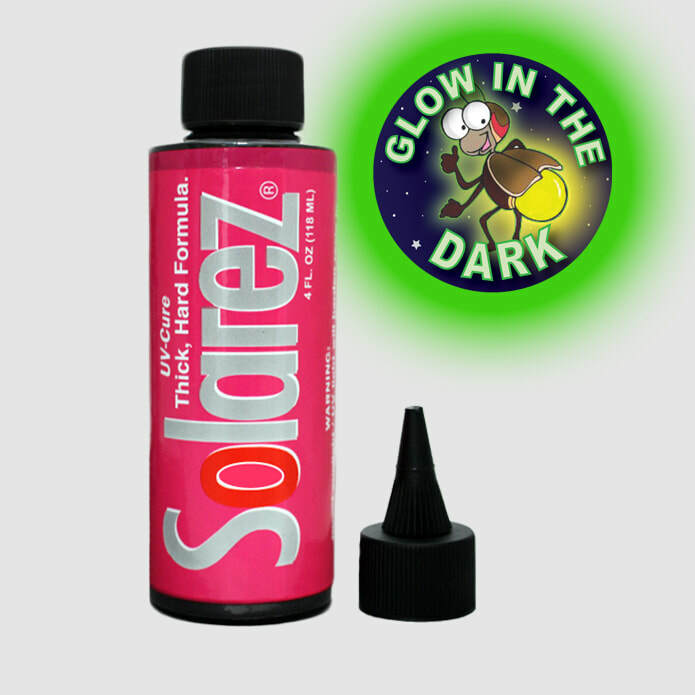 This is also great for repairing damaged flies or repairing home projects in a flash! 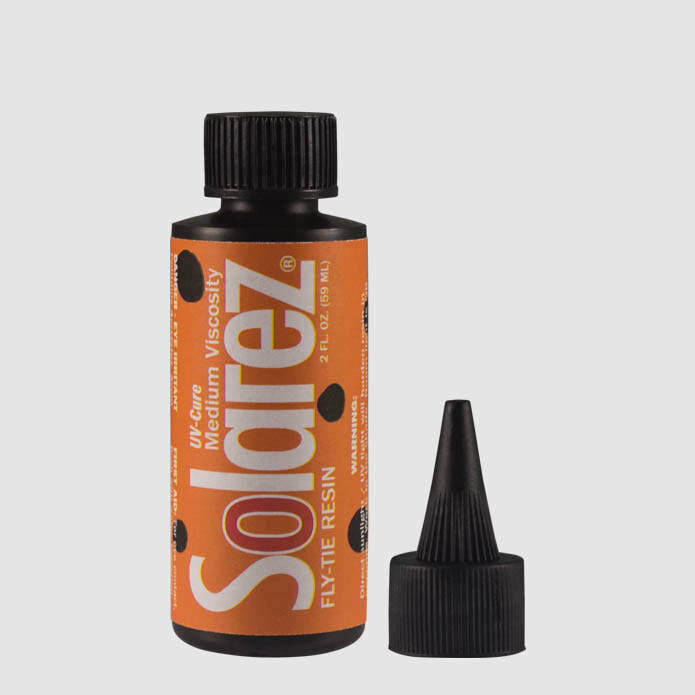 - Cures very hard and resilient. 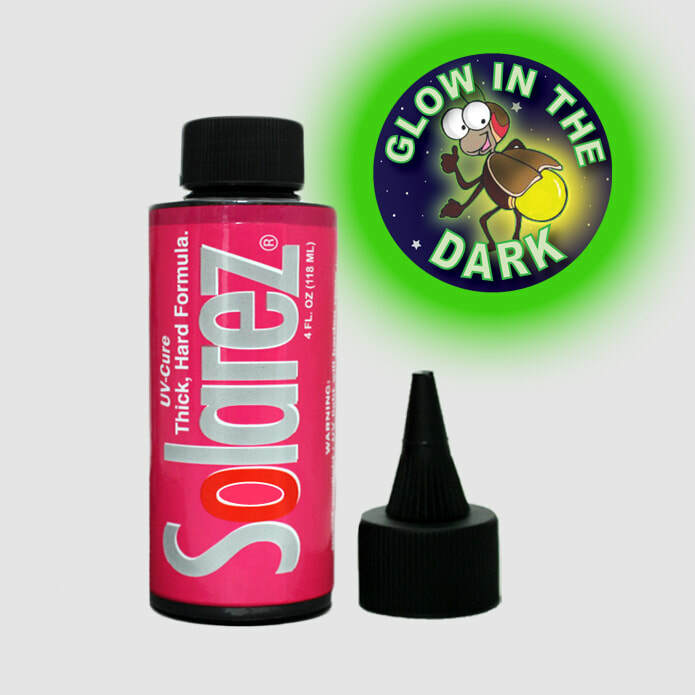 Glows intensely at night, especially if irradiated with our UV flashlight for a couple of seconds. Glow lasts several minutes and is very conspicuous. 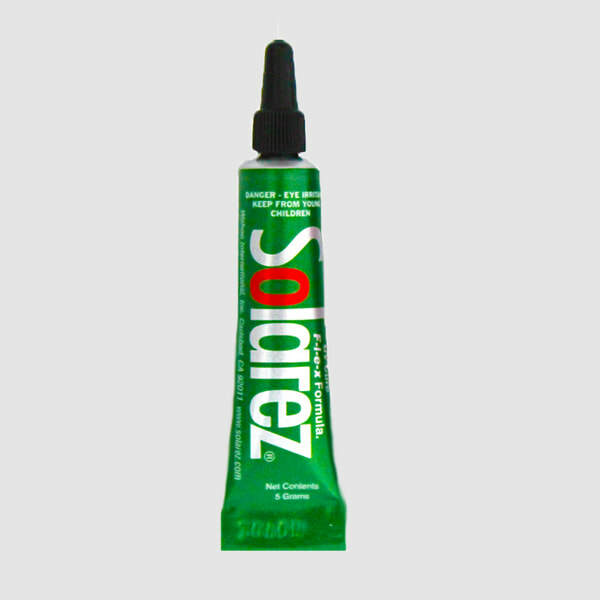 Cures "Bone Dry" to a clear, hard, glossy finish in under 10 seconds. No tacky finish that needs to be wiped off with alcohol like other products. 0.5 Fl. Oz. bottle with applicator brush. 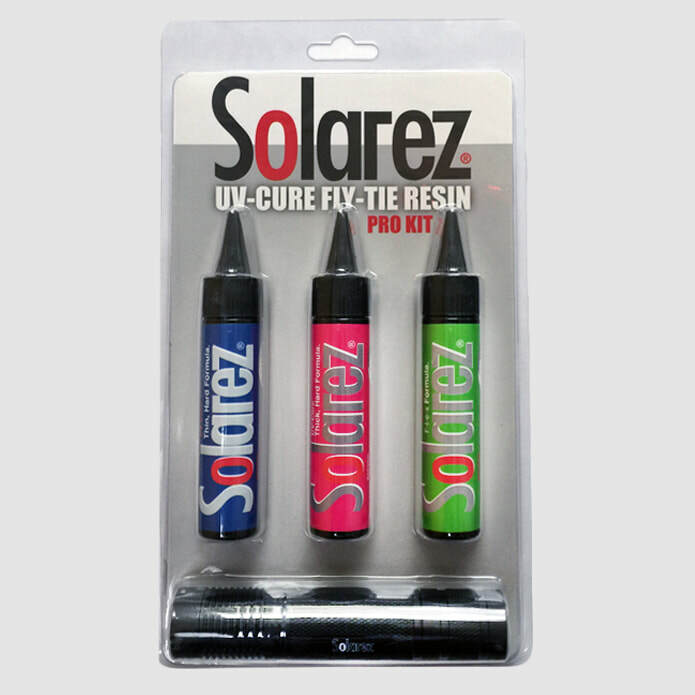 All three of our Solarez fly-tie UV resins. 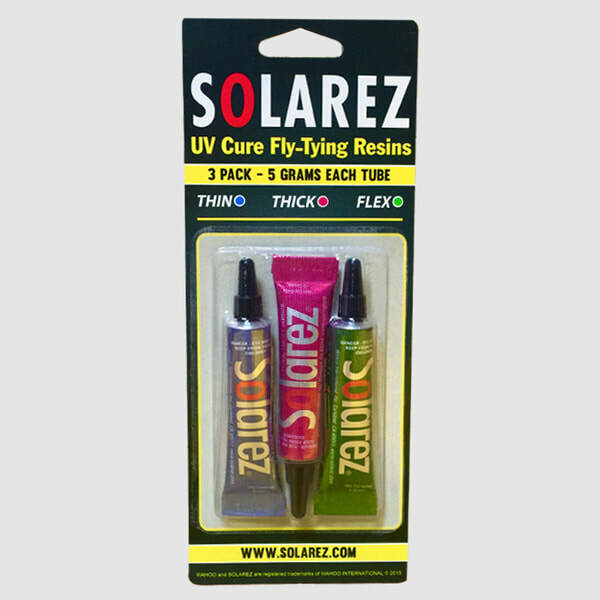 Each comes in a 5 gram tube (1/10 oz) with applicator tip - ample for many lures. Edited by Tony Lolli with contributions from Jim Krul, Alberto Calzolari and many other Solarez Pro Tyers, this book is a perfect guide to any tyer looking for tips and uses of Solarez Fly Tie resins. High Output UVA Flashlight - With more than 10X the power of our focusable beam flashlight. Use this torch for applications requiring extra penetration or extra surface cure to remove tackiness. 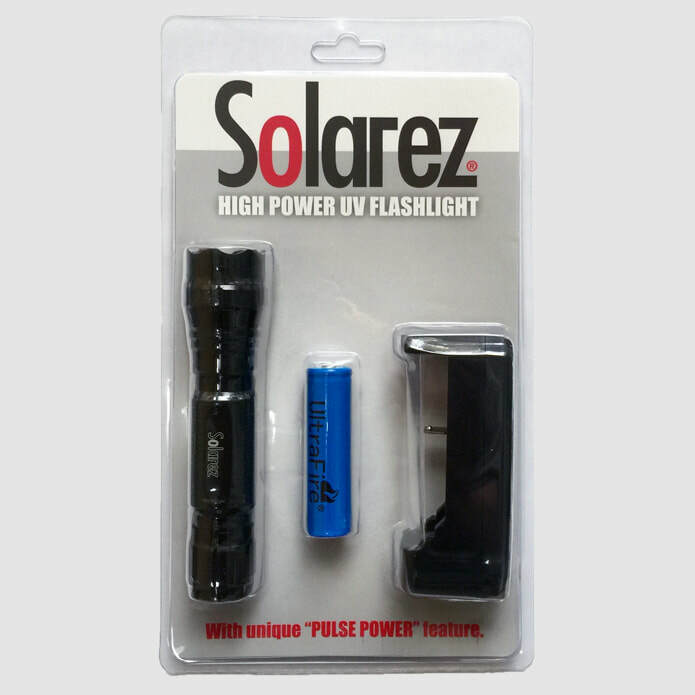 High Output UVA Flashlight Kit - Newest technology SMD ultra high output flashlight. 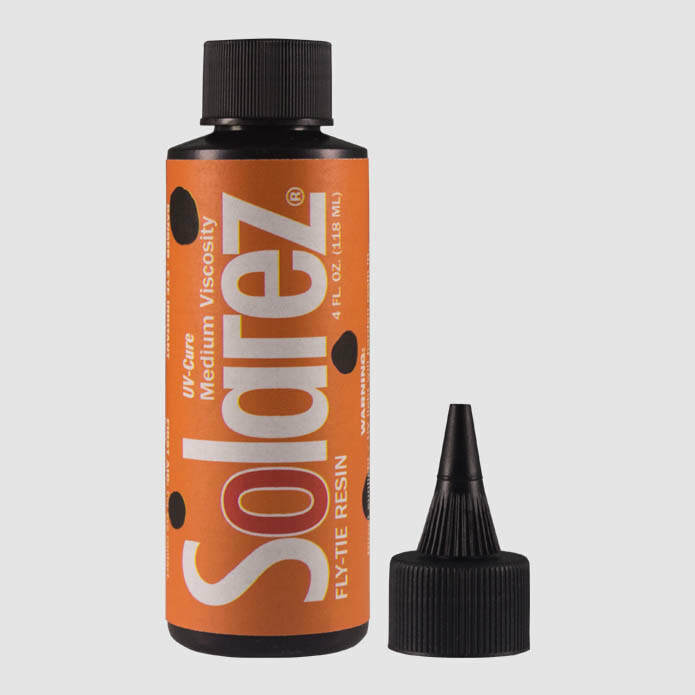 Cures Solarez resin with the correct wavelength. 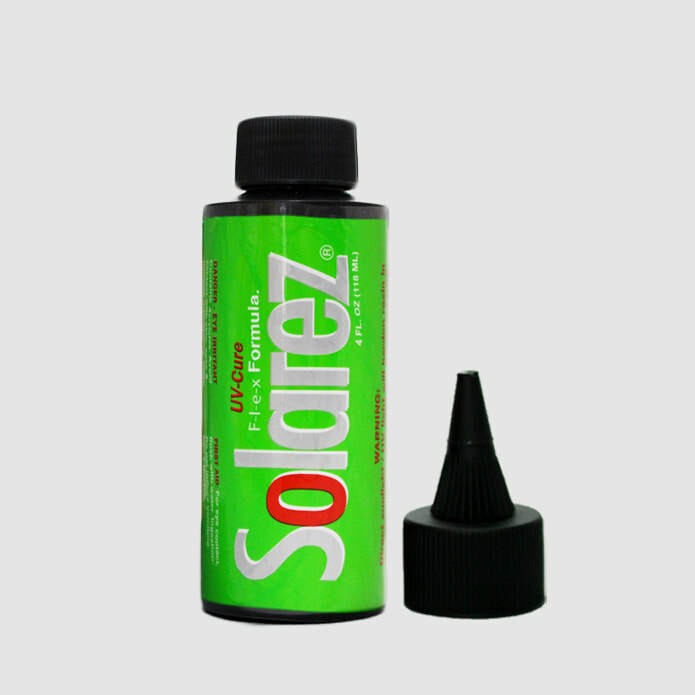 Typically cures Solarez resin in 30 seconds or less. Also has heat-abating "Pulse Power" function. 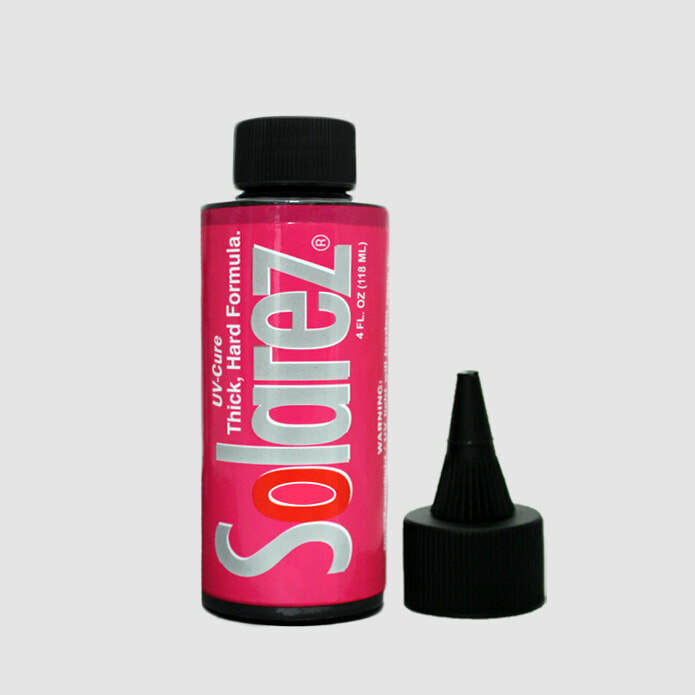 This reduces resin shrinkage and yellowing and increases bond. 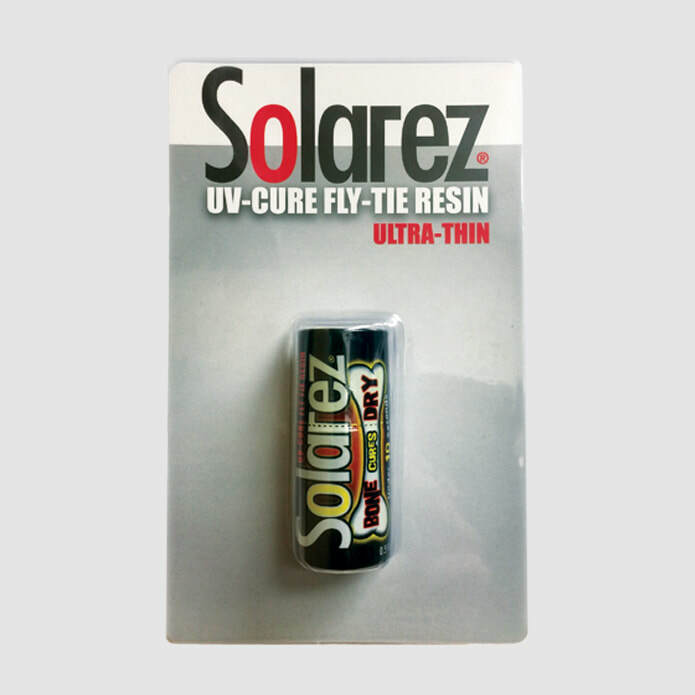 Comes complete with one rechargeable 18650 Lithium Ion battery and digital battery charger, good for hours of high intensity light and hundreds of re-charges. Charger has polarity indicator warning and READY signal. Battery Charger/ Rechargeable Battery - Digital Battery Charger and one (1) 3.7 volt UltraFire® rechargable battery. Sponge-Rez is a tough, clear, ultra-flexible resin forumlated to mend the most common types of catastrophes bodyboards are heir to; worn-out leash anchors, creased bottoms, delaminated decks, hulls or rails, sponge-deck (also known as rash-deck) and semi-fatal gouges. Sponge-Rez works on all types of bodyboard materials including Ethafoam, Surlyn, EVA, Vinyl, and Arcel, however it will melt styrofoam (EPS) cores. Sponge-Rez alsp repairs cracked, weathered swim fins. If applied to the fin blades, it increases their stiffness and thrust. Tough synthetic rubber that sticks to any surface. It dries to a clear polymer as a protective coating that wears like steel. 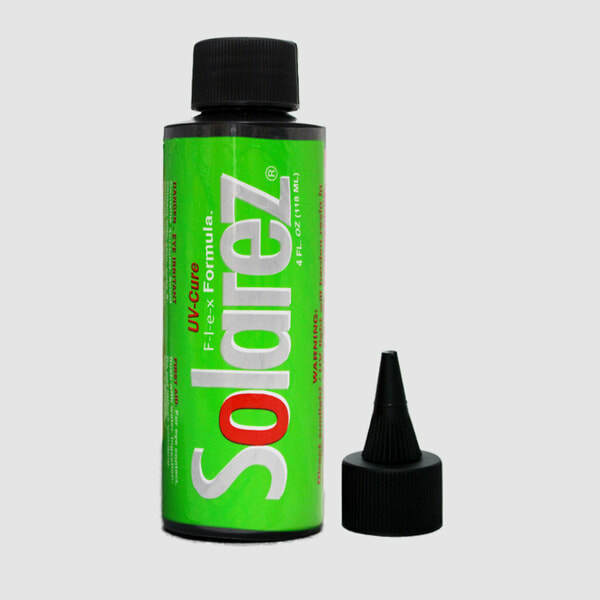 Use it to coat high-wear areas, re-laminate wood, seal out the elements, or as a glue where others have failed. 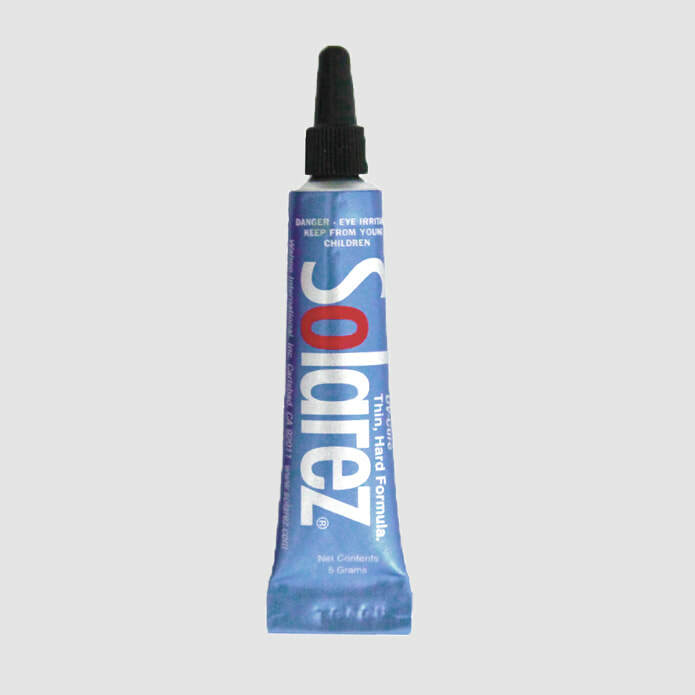 Solarez Shoe Repair will "ski-over" in 10-15 minutes and dries in about 2 hours. Nevertheless, a complete cure takes 24 hours especially when filling deep gouges.